Over the weekend I made some papaya salad. I think papaya salad is always best eaten when one craves it. I’ve made papaya salad before when I wasn’t craving it and it went to waste. I never thought I’d ever waste papaya salad since growing up, I didn’t eat very much of it and Mom’s version was a little bland for my taste buds, so I was surprised. I had a huge plate of papaya salad with a side of peanuts and it was so good! In the past, I’ve added peanuts to my papaya salads but then I ran out of peanuts and just never really cared to buy any for a long time. Recently, I bought some for a recipe tweaked from a Noodles & Company dish called, Indonesian Peanut Sauté (this is the only dish I eat there!) but never finished them. 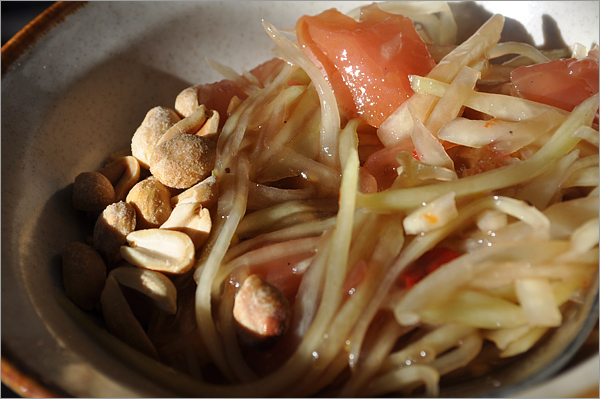 Anyway, papaya salad is great with peanuts. It gives it a peanut buttery-like kick with a crunch. It is awesomely delicious.